Steve Stoute's open letter to Grammy organizers ripped the organization and its 12,000-odd voters for snubbing Eminem and Justin Bieber at this year's ceremony, as well as Eminem and Kanye West at past events. "Over the course of my 20-year history as an executive in the music business and as the owner of a firm that specializes in in-culture advertising, I have come to the conclusion that the Grammy Awards have clearly lost touch with contemporary popular culture," wrote Stoute, who is currently CEO of the marketing company Translation. "Unfortunately, the awards show has become a series of hypocrisies and contradictions, leaving me to question why any contemporary popular artist would even participate." "We must acknowledge the massive cultural impact of Eminem and Kanye West and how their music is shaping, influencing and defining the voice of a generation," Stoute wrote. As for Bieber, he wrote, "How is it that Justin Bieber, an artist that defines what it means to be a modern artist, did not win Best New Artist?" 'Defining the voice of a generation','defines what it means to be a modern artist.' I can't help but ask for their definition of 'define.' It looks like Stoute also makes the same error I noticed from the Business Insider article where the terms 'record industry' and 'music industry' are used interchangeably. 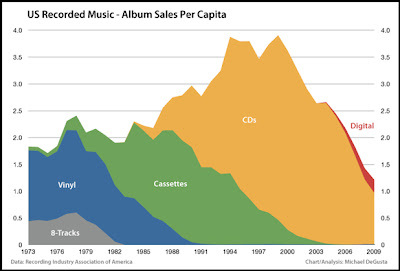 The music industry is bigger and more dynamic than ever, it's the record industry that's dying. The record industry was all along supposed to be in the business of music delivery, not cultural overreach and intrusion. This mission confusion is the same thing that has afflicted other 'too big to fail' industries and institutions such as big government, labor unions, traditional media, and academia. They have expanded so far beyond their original intent that not only have they broached the comfortable boundaries of the public, they have almost become completely inept at their core services. While the record industry gasps its final breaths, the production, enjoyment, and examination of music continues to flourish. There is more great music out there than there ever was, and more ways to access it. Research and technology has also allowed us to study music in novel ways, including the way we enjoy it. Brazilians Daniel Babalin and Rebecca Raia have embarked on a unique project called metrophones where they ask people on the street what they're listening to on their ipods. A beautiful website, after seeing so many different profiles and their musical preferences, you'll feel like you've just walked the streets of Sao Paulo all day talking to people about their music. Cracked has a list of five ways that music can mess with your mind including altering time perception and tapping into your primal fear. Brain Pickings has a piece on synesthesia (seeing music as colors) with some terrific examples from a few artists that have this unique gift of visualization. Included is Stephen Malinowski's fascinating Music Animation Machine that displays animated graphs to various compositions. Instapundit links to the same article and has more on synesthesia. Jaltcoh has a rebuttal to an idea in Jonah Lehrer's essay for Wired magazine The Neuroscience of Music that discusses the concept of pattern predictability and music enjoyment. He also links to Stephen Malinowski's unique graphical scores.